An atmosphere unmatched by any other restaurant or event venue, Café Intermezzo offers hand-spun crepes, international menu items, hundreds of different beverages, with and without alcohol, including specialty coffees and teas, and over a hundred pastry choices including tortes, tarts, cheesecakes, and pies. 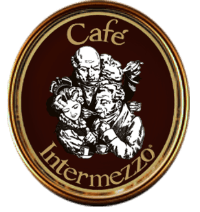 There is truly something for everyone at Café Intermezzo, where an international, trans-cultural, unique experience awaits in our 19th century European Coffeehouse. Whether you’re hosting a corporate gathering, breakfast, luncheon, *off-site catering function,* or large event, Café Intermezzo will provide you with the utmost accommodation, exceeding expectations. Offering an array of menu options, private dining spaces, and packages, your event with Café Intermezzo is sure to impress your guests. We customize your menu to serve your tastes, budget, and desires. From dessert bars and wine tastings, to simple or extravagant company parties, to dinner gatherings, we are here to serve you.